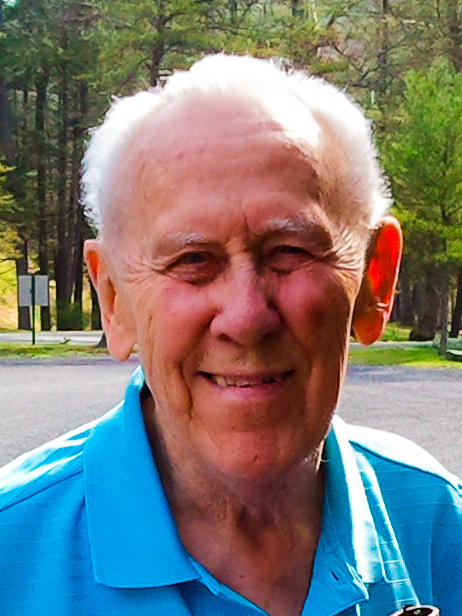 Edward William Fanslau, 100, of Westminster died early Friday morning, April 12, 2019 at Carroll Lutheran Village. Born April 9, 1919 in Paterson, NJ, he was the son of the late Gustav and Louise (Miller) Fanslau. His wife of 59 years, Velma (Vatthauer) Fanslau, predeceased him in 2003. Ed was retired from Bergen Pines Hospital, Paramus, NJ, where he worked as an accountant. He was very active in his church, St. Paul’s Lutheran Church in Pompton Lakes, NJ, serving as their organist for 65 years and Choir Director for 31 years. He loved hiking and cross-country skiing and was a hike leader for 40 years with AMC, ADK, and WTW. He co-founded the Toastmasters in Midland Park, NJ and was a member of Toastmasters International for over 50 years, and also was a member of the American Guild of Organists. Surviving him are his children, Carol Rabenhorst of Finksburg, MD, Mark Fanslau (Alice) of Oak Ridge, NJ, Ellen Schiller (Cliff) of Blairstown, NJ, and Lois Smith (Matthew) of Manchester, MD, 9 grandchildren and 7 great-grandchildren. He was precedeased by his brother, Roy Fanslau and his son-in-law, Thomas Rabenhorst. The family will receive friends at the MYERS-DURBORAW FUNERAL HOME, 91 Willis Street, Westminster on Friday, April 19th from 4 PM to 6 PM and at Carroll Lutheran Village Krug Chapel on Saturday, April 20th from 9:30 AM to the time of the service at 10:30 AM. Private burial will be in George Washington Memorial Park in Paramus, NJ on Monday, April 22nd. Memorial donations in Ed’s name may be made to St. Paul’s Evangelical Lutheran Church, 220 Hamburg Turnpike, Pompton Lakes, NJ 07442. There's still time to send flowers to the Visitation at the Myers-Durboraw Funeral Home from 4:00 PM to 6:00 PM on April 19, 2019.